How to deal with insecurity in a relationship? They wouldn’t stop bickering. That was the crux of the voicemail beckoning my help in the form of marriage counseling. Returning the call, I understood my clients needed help, and our introductory 90-minute therapy session was on the books. I could feel the apprehension as our session began. I congratulated my clients on their collectively agreed upon decision to see a marriage therapist. 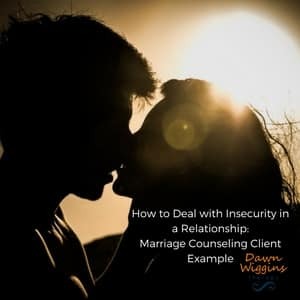 Some would say that alone is a breakthrough … Read this example marriage counselor Dawn Wiggins shares about a couple who is dealing with marriage problems including insecurity, rejection, lack of trust, and how she helped them. As quickly as the session began, I could tell they remained trapped in their pattern of miscommunication. I would redirect the couple to engage with me, and they went back to debating the details. Endless attempts to convince each other of the ‘correct’ perspective. Nitpicking details, the order of events, who said what and when. Stopping them, I pointed out they were paying me to listen while they repeated the same thing they do at home. (I often use this as a sobering technique – most people hate wasting money). I asked them what the purpose of marriage therapy was. Blank stares followed by some muttering about mediation. All forms of therapy are about increasing self-awareness. With greater awareness, we have more choices and better solutions. This leads to more effective action and improved outcomes. Now that we re-clarified the purpose and goal, we could go back to the problem at hand. They were both struggling to let go of the hostility and defensiveness. What Does Defensiveness Do to a Relationship? Defensiveness keeps you from looking within and touching the white-hot pain of your vulnerable feelings. It feels safer to stay on the surface. In actuality, the bickering reinforces distance between a couple. It blocks any forward progress, communication or resolution. Once I had their attention, I invited them to join me in trying something different. I asked the husband (the more willfully vulnerable of the two) to explore the feelings underneath his argument. He was moving into experiencing his feelings. A slight nudge from his left (logical) brain into his right (big picture) brain. He was visibly uncomfortable but determined. His struggle lies in his brain telling him to focus on the details. I asked him if rejection and insecurity were something unique to his marriage or if they existed prior. With a long pause, a heavy sigh and what seemed to be some deliberate soul searching he admitted that these feelings predated his marriage. Even more progress. Now he could begin to consider how these uncomfortable feelings were exacerbated by the circumstances in his marriage. This created space for him to learn more about himself and his unconscious way of responding to emotional pain. It allowed him to see where he was unfairly blaming his feelings on his wife. It also left a clearly defined idea of the most significant marriage problem: lack of trust. At this point, the bickering had slowed to a mild playful tone, but not entirely eradicated. My clients were engaged in a more productive process. The wife was watching her husband relinquish control and open up to himself and me. The energy in the room was softer and more vulnerable. She became more available and willing to let her guard down. I queried her about her decision-making process. I wanted her insight into her feelings and behaviors. This Intel hinted that she lives in fear, but I needed more. Earlier in the session, during the bickering, she continuously insisted that she didn’t matter to him – that she was invisible. I asked her to think back to an example earlier in her life when she felt as though no one listened to her. She hid her face and burst into tears. I encouraged her to breathe through the painful feelings. Once she was able to, she began to share about a life of doing what everyone around her told her to do. And, always feeling like she fell short. She recounted stories of feeling as though she had to please her family and peers by being pretty enough, athletic enough and smart enough. The woman sitting in front of me was so clearly lost and unsure of who she was. From here I was able to show them how the wife’s uncertain sense of self-was impacting their marriage. And, leading her to act out. Her rebellion was a desire for autonomy and a voice. While independence and being heard are good, the acting out was destroying the trust in the marriage. From here we were able to have a collaborative dialogue about how to move forward. It’s never easy to know how to deal with insecurity in a relationship. But, with experienced guidance you can find, address, and overcome the blockages. My married clients began to understand the importance of working through the underlying issues; which was vastly different from their insistent bickering at the start of the session. The wife shared her fears about “what if my husband doesn’t like the real me”? And the husband shared his fears about “how long should I wait for her to find herself”? These were great questions that I was able to address with them. All in all, this was a successful marriage therapy session. The married couple shifted a long-standing pattern of bickering and learned a great deal about themselves. They opened up and finally faced their fears, together. The immediate and ongoing goal is to maintain this productive energy and build on it in subsequent sessions. In the meantime, I sent them home with some homework to encourage self-reflection between appointments. This type of breakthrough is available every time a couple walks into marriage therapy. If it sounds a bit scary, it is. If it seems inspiring, it is. Do you hear yourself or your relationship in this example? If this seems anything like you, don’t wait. Don’t let your underlying fear dissuade you from getting help. Humans are wired for connection. And it’s completely normal to need help creating and maintaining relationships. Especially in today’s world. Do you want to find out how to deal with insecurity in a relationship? I’m only an email or phone call away.